Cabbage has a long history of use both as a food and a medicine. It was developed from wild cabbage, a vegetable that was closer in appearance to collards and kale since it was composed of leaves that did not form a head. It is thought that wild cabbage was brought to Europe around 600 B.C. by groups of Celtic wanderers. It was grown in Ancient Greek and Roman civilizations that held it in high regard as a general panacea capable of treating a host of health conditions. While it's unclear when and where the headed cabbage that we know today was developed, cultivation of cabbage spread across northern Europe into Germany, Poland and Russia, where it became a very popular vegetable in local food cultures. 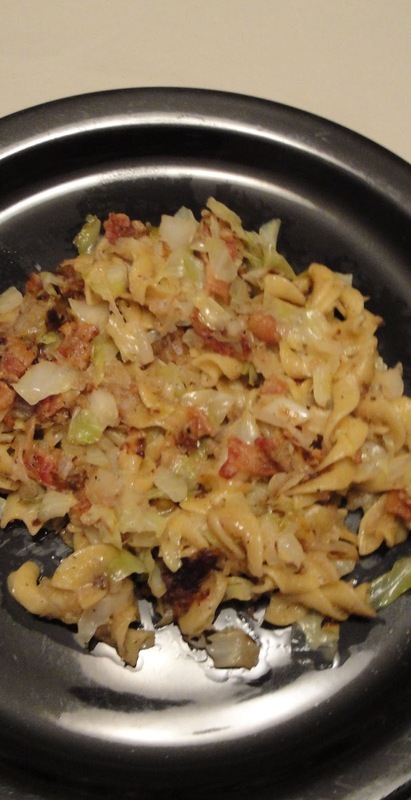 The Italians are credited with developing the Savoy cabbage. Russia, Poland, China and Japan are a few of the leading producers of cabbage today. Sauerkraut, a dish made from fermented cabbage, has a colorful legacy. Dutch sailors consumed it during extended exploration voyages to prevent scurvy. Early German settlers introduced cabbage and the traditional sauerkraut recipe were introduced into the United States. As a result of this affiliation, German soldiers, and people of German descent were often referred to as "krauts." Inexpensive dish that will feed the entire family. So good! In large skillet, add bacon, cook until crisp. Remove bacon and drain on paper towel lined dish, then transfer to a bow, set aside. Add onions to the skillet, season with salt, pepper and garlic powder, stir, cook until onions are golden. Add potatoes, season with salt, pepper and garlic powder, stir, cook about 8 minutes. Add cabbage, water, salt, pepper and garlic powder, stir, cover, cook until cabbage almost tender, about 8 to 10 minutes. Note: Make sure your potatoes are dry before you add them to the skillet. Great dish, I will share with my family! This sounds like something I would love! Interesting read... Thanks! I had no idea cabbage was ever used for medicinal purposes! Cabbage is one of the things I grew up not liking because my mom didn't like it. Now my husband is a big fan and I am slowly adding more dishes with it as an ingredient. This is a great one to work into our rotation. This does sound delicious Christine, never heard of Haluski before. I love how you always provide information with your posts. Thanks and have a wonderful day. Mmm--this looks good! I really like cabbage when it has lots of other flavors with it. Wow what a great combination here! This does look like one of more appealing dishes out there when it comes to cabbage. The onions and the bacon must add some amazing flavor. Great post! 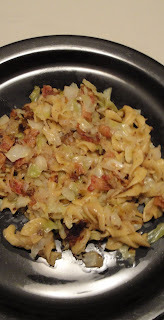 I remember my husbands family making this...I could never figure out why they wanted cabbages and noodles together. ...but I gotta admit, it's darn tasty! i love haluski! this is always served at block parties in the area where I grew up! I like this recipe. It reminds me of something I would have eaten growing up. This sounds like a great way to use up some cabbage! I haven't cooked cabbage in a long time. Thanks for the recipe and the reminder. I have made this twice and love it. I did add polish kielbasa when I cook the bacon and it is very good. Glad you enjoyed it, Beverly. I am making this dish tonight for tomorrow. I was thinking of making it all and then throwing it in the crock pot in the morning. Do you think this will cool the cabbage to much? What would you suggest? I've never cooked this in the crock pot.